This charismatic collaboration between van Nuis and Brown is as engaging as it is imaginative...a splendid recording...impeccable artistic synergy...voice and guitar sashaying in unison with sensuality and passion..ardent emotion and hypnotic resonance. Chicago based vocalist Petra van Nuis and her husband guitarist Andy Brown have impeccable artistic synergy, something that is superbly demonstrated on their delightful duet album Lessons Lyrical. The 17 standards that van Nuis and Brown interpret are stripped down to their basic melodic elements and are reconstructed with such warmth and intimacy that highlight the beauty at the core of each one. On the effervescent "Save Your Sorrow For Tomorrow" van Nuis' graceful vocals soar over Brown's energetic chords. Brown's guitar stylings brim with carefree romanticism. While the exotic "Bali Hai" features voice and guitar sashaying in unison with sensuality and passion. Brown takes an expressive and inventive solo that meanders far from the theme and returns to it with breathtaking agility. Brown opens the dramatic "You're Blasé" with overlapping layers of richly hued and reserved phrases. Van Nuis enters with her haunting and tender singing, making the track truly captivating. Elsewhere van Nuis starts off "You Must Believe In Spring" unaccompanied, filling the silence around her with ardent emotion and hypnotic resonance. Brown joins with sparse strums that coalesce into a pensive and melancholic song. There are also several playful and light-hearted tunes on this enjoyable album. "Slow Poke" for instance features Brown's folkish lines that flow effortlessly and buoy van Nuis' joyful vocals. Van Nuis articulates with charm and whimsy the humorous lyrics while Brown supports her with is bright and acerbic strings. Meanwhile the amusing "Doctor Jazz" harks back to the early days of New Orleans jazz. This Joseph "King" Olivercomposition showcases van Nuis and Brown's lithe and crisp musical repartee and their respective virtuosity. This charismatic collaboration between van Nuis and Brown is as engaging as it is imaginative. Lessons Lyrical is a splendid recording that casts these, often performed, pieces in a refreshingly modern light. The complementary and harmonious individualities of both musicians is what makes this release unique. "Interpreters with extraordinary talent are required for these texts to properly swing with music, to infuse them with a soul. The musical couple Petra van Nuis and Andy Brown possess these almost magical abilities...he seems to have the expressive range of an entire orchestra in his fingers." Lyrical texts use images to express facts and feelings; they allow a wide margin for associations and interpretations. Interpreters with extraordinary talent are required for these texts to properly swing with music, to infuse them with a soul. The musical couple Petra van Nuis and Andy Brown possess these almost magical abilities, as can be heard on this CD. Petra van Nuis captivates with her youthfully charming, supple and yet very clear vibrato-less voice, as well as her outstanding articulation and phrasing. Thus, she successfully renders ballads like “Any place I hang my hat is home” or “Time for love” with great feeling, yet without any false sentimentality. As her congenial partner, the guitarist Andy Brown manages with a few chords and melodic strands to conjure up a variety of finely-nuanced moods. He seems to have the expressive range of an entire orchestra in his fingers. He also shines as a soloist in the long intro to “You’re blasé” or “C’est la vie,” where he briefly quotes the French national anthem. Somewhat outside the mold of the 17 pieces is the spirited old New Orleans tune “Doctor Jazz,” in which Petra van Nuis shows that she can also sing with energy and vigor. But emotions are also central in this piece. With Lessons Lyrical, the listener can take a walk with mental images that Petra van Nuis and Andy Brown have drawn at the highest musical level. This stellar duets album is beautifully romantic, pure and ultimately masterful...swings magically...delicate, dynamic and ethereal...a gorgeously under produced jazz duet recording...undisturbed by commercial concerns. The soul throughout this recording is just relentless...an essential purchase. The duo’s take of the Johnny Mandel classic “A Time For Love” is a true album highlight. Brown’s fingerpicking is simply fantastic and Nuis’ vocal delivery is sweet yet melancholy. Brown & Nuis’ rendition of The Gershwin Brothers’ “Who Cares” swings magically. “Try To Remember” is delicate, dynamic and ethereal. The soul throughout this recording is just relentless. Listening to this recording, you truly feel as if you’re in a real jazz club where the musicians are undisturbed by commercial concerns. You can picture the rhythm section on a break as these two masters take over with their own take on many timeless standards. At times, Andy Brown’s guitar comping is reminiscent of truly great pianist. It’s evident that Brown knows the changes to these compositions intimately. Petra Van Nuis’ subtle vocal style serves the theme of each song perfectly. 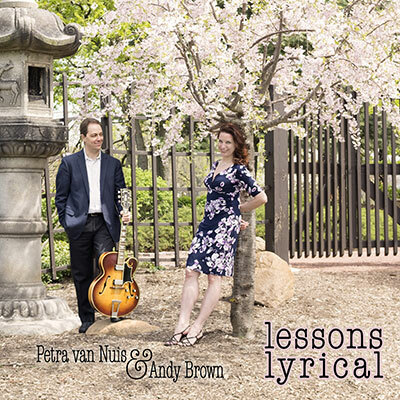 If you’re looking for a gorgeously under produced jazz duet recording with two greats serving up their own twist on some of the most memorable classics and standards, “Petra Van Nuis & Andy Brown’s Lessons Lyrical” is an essential purchase. With her all the way, Andy digs deep to give Petra the perfect support with rich, full chords...Flawless and interpretations of songs, some of which you thought you knew only to find out you didn't really know them at all! There's also a few undiscovered gems as well as some you'd forgotten about. I guarantee they'll never be forgotten again! The Chicago based couple share a rapport that stretches from the breakfast table to the bandstand or, in this case, the recording studio and back again. That rapport is evident over 17 delightful tracks. No conveyer belt delivery here but instead, a voice that makes every day seem like Spring. Flawless and original interpretations of songs, some of which you thought you knew only to find out you didn't really know them at all! There's also a few undiscovered gems as well as some you'd forgotten about. I guarantee they'll never be forgotten again! With her all the way, Andy digs deep to give Petra the perfect support with rich, full chords and fill-ins as well as keeping the boat afloat during his own angular solos. The most 'lyrical lessons' you'll ever learn whether you're a singer or a guitarist or, simply, a music lover. The very first song on Lessons Lyrical, “Speak Low” (Weill/Nash) is a truly remarkable example of the precision and balance that Brown and van Nuis have developed together over the years. The seamless integration of voice and strings can be expected from the mellow sound of a James Taylor or Paulinho Garcia singing while playing guitar solo. But to achieve that as a duo is far more rare and calls to mind truly great pairings like Paul Simon and Art Garfunkel in pop. On this song, even jazz legends like Ella Fitzgerald and Joe Pass would be hard pressed to match the sheer symmetry and syncopation of van Nuis and Brown’s performance together. Bright, upbeat, and optimistic the lyrics of “Save Your Sorrow For Tomorrow” (DeSylvia/Sherman), “I‘ve Got A Pocketful Of Dreams” (J. Monson/J. Burke), and “Oh, What a Beautiful Morning” (Rogers/Hammerstein) are perfectly suited for the tonal qualities of van Nuis’ voice. The latter came from the Broadway show Oklahoma in 1943 and quickly became one of the most popular American songs to emerge from the war years. Brooks Atkinson, while reviewing the original production of Oklahoma in The New York Times, wrote this number and changed the very direction of musical theatre. After a verse like that, sung to a buoyant melody, the banalities of the old musical stage became intolerable. Brown keeps the pace lively and evolving, allowing van Nuis to display her inherent charm and appeal to maximum advantage with these cheerful selections. Another show tune, “Bali Hai” (Rogers and Hammerstein) is from South Pacific in 1949. Bali Hai is the name of a mysterious volcanic island visible from the isle where most of the action takes place. Brown and van Nuis are remarkably able to capture the mystery, majesty and beauty of the elaborately, haunting orchestral arrangements that the song is best remembered for, using only voice and guitar. “Slow Poke” (King/Stewart/Price) was intended to be a country and western song that successfully crossed over to pop and enjoyed a run on both billboards: country and western and pop charts. Van Nuis and Brown manage to impart some uncomplicated homespun charm into their rendition of the tune where it is most appropriate. Told from the view point of an aging courtesan reflecting on her exciting and eventful past life (while lamenting her own loss of innocence), “When The World Was Young” (Phillippe Gerard/Vannier/Mercer) offers the duo an opportunity to put their versatility on display. Using tone and texture to signal both the passage of time, and the sadness that sometimes accompanies developing maturity, van Nuis and Brown tell a complete story that goes beyond the mere scope of the lyrics. Almost every syllable of “Any Place I Hang My Hat Is Home” (Arlen/Mercer) is elongated and stretched for maximum effect as van Nuis attempts to emphasize the yearning to wander in search of new experiences, all the while making each new place a new home. This often recorded tune originated in the musical St. Louis Woman in 1946. Brown’s guitar is a virtual mirror to van Nuis’ very deliberate tone and enunciation. The next two songs help illustrate both the duo’s large range and their instinctive ability to choose the correct tone for the moment. Brown begins “A Time For Love” (Mandel/Webster) with a kind of gentle, almost harp like introduction that sets the mood for the wistful, dreamy lyrics van Nuis will follow with. In stark contrast is the quick paced, New Orleans jazz style, counterpoint and mood that Doctor Jazz (Oliver/Melrose) delivers. Playing them both with honesty, emotion and their signature synchronization sets a high bar for others to follow. Starting off is Brown’s guitar introduction, almost two minutes in length, “You’re Blasé” (Hamilton /Siever) may have you wondering briefly when and if van Nuis is going to finally enter to complain of her partner’s lack of emotion causing her to have a feeling of anxiousness. The duo is successful in conveying this message through virtually every moment of this tune. “Who Cares” (Gershwin/Gershwin) carries a message of strong optimism in the face of terrible economic upheaval. Love conquers all and in particular, a bad economy seems to be the message here. Even while she is reciting some lyrics that are pretty horrific, if taken out of context (who cares if the sky should fall into the sea? ), van Nuis manages to maintain her bright and cheery demeanor. Brown’s lively string work carries forth both the positive vibes and optimism. Recorded by a plethora of vocalists in a wide variety of musical styles, particularly in the mid-sixties when it was first released, “Try To Remember” (Schmidt/Jones) from the show The Fantasticks aroused my curiosity more than any other song when I first viewed the track list to this album. The unusual rhyming scheme of the lyrics, offers van Nuis her chance to shine brightly, and shine brightly she does. Her clear, simple, engaging, vibrato-less voice and presentation seem to be made for this song. Brown gives her the room to operate by not taking an extended solo and skillfully supporting her from the background. Until now, Andy Williams had done my favorite version of this song, but now he has to sit farther back in the bus. A trio of uncomplicated tunes, with words and music written entirely by bassist Red Mitchell, “Simple Isn’t Easy,” delivers the exact message that the title implies. A bit of a mystery, “Peter Had A Wolf” (unknown) is a kind of a musical nursery rhyme, and was given to van Nuis by friend and mentor, Chicago jazz legend Judy Roberts. Roberts had picked the song up from a musical revue she had been part of early in her career. With no idea who had written the song, and not successfully able to research its origins, Roberts carried it in her mind for many years before meeting van Nuis and deciding that she was the right vocalist to sing it. “C’est La Vie” (White/Wolfson) has the simple message of accepting what life brings, delivered with stoicism yet sympathetically by van Nuis and Brown. Full of the beautiful melody and lush, descriptive lyrics that Michael Legrand songs are known for, “You Must Believe In Spring” (Legrand/Bergman/Bergman/Demy) is perhaps a tad too slow to show off van Nuis’ voice to best advantage. Fortunately, she has the consummate partner in Brown, whose rich chord work can create the perfect framework for a musical background that best showcases her voice, even when the inherent speed and tone of the song does not. Lessons Lyrical is a memorable and enjoyable CD and the latest chapter in a continually unfolding success story that Petra van Nuis and Andy Brown who have been telling with their lives and music since their arrival in Chicago. All of their fans, friends and musical colleagues, including myself, eagerly await the next chapter. ...the bravest project two young musicians could possibly put out in today's market. A quaintly brilliant 'platter' amidst a world becoming increasingly less interested in subdued tender truly artistic music from the heart....deeply talented and endearing to the listener...a touch of pure class...just what this chaotic world needs right now. This new CD release "lessons lyrical" by husband and wife team, vocalist Petra van Nuis and guitarist Andy Brown has got to be the bravest project two young musicians could possibly put out in today's market. A quaintly brilliant "platter" amidst a world becoming increasingly less interested in subdued tender truly artistic music from the heart. Border line inane – deeply talented and endearing to the listener. No drums, no bass, no other instruments, no backing tracks, no pitch correcting electronics – a touch of pure class. Just Petra and Andy - just what this chaotic world needs right now. So, if this CD is only Andy and Petra where she is singing melodies with her "whispery" voice and he is providing rhythm on his jazz guitar - what can Andy possibly play on the "breaks?" Most guitarists without a backing band would probably die on the solo breaks – however, Andy just happens to be the only protégé of the late finger style jazz guitar legend – Kenny Poole. (Hence, why this review shows up on the Ohio Fingerstyle Guitar Club web site.) Kenny spent his whole life playing solo guitar that included bass lines and chords along with his melodies. Andy must have been listening when Kenny was playing because his "breaks" suffer little from a drop in entertainment value. In fact, I would have loved to have been in the recording studio when they recorded this album because I swear that it sometimes sounds like Petra is teasingly throwing Andy "under the bus" with how she delivers a break to him implying, "Now, what are you going to do with this one?" And, folks, he plays himself out of it every time. Pour yourselves a glass of wine – kick your shoes off – lay back and enjoy listening to two talented lovers playin' their music to, for, and with each other. Andy is a portable orchestra...admire his splendid accompaniment...a wonderful musical team...their unity is delightful...the overall effect is spare but rich...they have the most dear and lasting lessons for anyone who can hear and feel. This is a clangorous world where people have trouble getting their message across, so something gentle is more than welcome. That quality of intelligent gentleness lifts the new CD, LESSONS LYRICAL, by singer Petra van Nuis and guitarist Andy Brown, above the ordinary. By "gentle," though, I don't mean soporific — this is not aural Valium — but it comes in the ear like honey. Don't let LESSONS make you take a step back, however. There's not a hint of the classroom or the ashram here, just songs selected because their melodies and lyrics contain the gentlest of life-lessons to be absorbed, remembered, enjoyed. The title refers to the lessons both Petra and Andy acknowledge with gratitude from their heroes and mentors, the musicians and elders who gave of their life experiences. And you can hear that loving wisdom throughout this CD. Petra and Andy are a wonderful musical team (they're also married, and they don't bicker, either in words or notes): they've worked together so well and so kindly that their unity is delightful. Petra's singing is perfectly aimed at the listener: her sweet voice, clear diction, and individualistic phrasing set her apart from many other singers. She values the lyric message without pounding it into our ears, but it's clear the words mean everything to her. And she improvises in her quietly swinging way: compare her first and second choruses on WHO CARES? for a vivid but soft-spoken example. She can be tender, rueful, wistful, but she can also romp: her summons to DOCTOR JAZZ is a pager that no medical professional could ignore. For his part, Andy is a portable orchestra, a wonderful soloist — hear his opening soliloquy on YOU'RE BLASÉ and his solo choruses on this disc, and admire his splendid accompaniment. The overall effect is spare but rich, making this a disc to be savored rather than gobbled down in a sitting. In person, Andy and Petra are anything but professorial or somber. They don't lecture or pontificate. But it's clear they have the most dear and lasting lessons for anyone who can hear and feel. "Ms. Van Nuis has a sweet and youthful voice, does justice to lyrics, and improvises with subtlety. Andy Brown is a very skilled swing-based guitarist who can operate well as a one-man orchestra, swinging like a big band or playing sparse accompaniment on ballads." Husband and wife guitarist Andy Brown and singer Petra van Nuis work regularly in the Chicago area. Lessons Lyrical, a set of vocal-guitar duets, can be thought of as a follow-up to their fine 2009 recording Far Away Places. Ms. Van Nuis has a sweet and youthful voice, does justice to lyrics, and improvises with subtlety. Andy Brown is a very skilled swing-based guitarist who can operate well as a one-man orchestra, swinging like a big band or playing sparse accompaniment on ballads. Lessons Lyrical features the duo exploring 17 songs that are standards from several eras plus a few obscurities. Ranging from “Oh What A Beautiful Mornin’” and “Bali Hai” to “You’re Blasé” and a pair of 1920s songs (“Save Your Sorrow For Tomorrow” and “Doctor Jazz”), these delightful and cheerful renditions cover a variety of moods and tempos. And it is a joy hearing such forgotten numbers as “Peter Had A Wolf” (contributed by Judy Roberts) and Red Mitchell’s “Simple Isn’t Easy.” Lessons Lyrical is easily recommended. With the kind of simpatico that makes the two feel like you are listening to one, this set is a pure bred adult/jazz charmer...Smoking stuff throughout. Kind of a modern version of Jackie & Roy, this couple took time off from their relentless gig schedule to run into each other in the studio and let's us eavesdrop on a duo set that is loaded with the kind of intimacy they probably wish they had time for. With the kind of simpatico that makes the two feel like you are listening to one, this set is a pure bred adult/jazz charmer. And they didn't feel the need to do "Nature Boy"; five extra stars for that. Smoking stuff throughout. Great solo jazz guitarists also make great accompanists, Joe Pass and Martin Taylor for instance. Andy Brown is one such Player. This new CD with his wife vocalist Petra van Nuis is a lesson on accompaniment as well as “Lessons Lyrical”...the pair really swings...with their fine talent I see a bright future. Great solo jazz guitarists also make great accompanists, Joe Pass and Martin Taylor for instance. Andy Brown is one such Player. This new CD with his wife vocalist Petra Van Nuis is a lesson on accompaniment as well as “Lessons Lyrical”. Hailing from Evanston just outsde Chicago, the pair are in high demand in Illinois. Petra has a soft voice and knows how to phrase well and is ideally suited for an intimate duo such as this. There is a great mixture of songs on this 17 track CD. On “C’est La Vie” I particularly liked Andy quoting the French national anthem at the end. The pair really swing on “Doctor Jazz” and “I’ve Got a Pocketful of Dreams”. This is the couple’s second Duo CD since their 2009 release “Far Away Places”. It takes a lot for a young couple to commit full time to jazz these days but with their fine talent I see a bright future.